The smalltooth sawfish is a species closely related to the shark and ray. The body is dark mouse gray to blackish-brown in color above and white to grayish white or pale yellow below, and it is flattened and shark-like in appearance. Like rays, the mouth is located on its flat underside. At birth, smalltooth sawfish are about 1.97 feet in length, and adults can reach up to 24.9 feet in length. Despite its fearsome appearance, sawfish are gentle creatures and will not attack humans unless provoked or surprised. The most striking appearance of this fish is its long, toothy saw or snout called the rostrum. The rostrum is covered with motion sensitive pores that allow sawfish to detect the movement and even heartbeats of prey that may bury themselves on the ocean floor. It is a quarter of the total length of the body and has between 25 and 32 pairs of small, sharp teeth. Like an aquatic metal detector, the sawfish hovers over the sea floor looking for hidden food such as crabs and shrimp. When prey is detected, the rostrum is used as a digging tool to unearth it. Also, when other suitable prey swims by (such as schools of mullet fish), the sawfish will spring from the bottom and slash furiously with its saw in an attempt to lacerate or stun as many individuals as possible. The saw is also used for defense against predators such as sharks. This fish can exist in both saltwater and freshwater, and prefers fairly shallow water with muddy or sandy bottoms such as rivers, streams, lakes, creeks, bays, lagoons, and estuaries. Although it prefers depths of no more than 400 feet, it will cross deep oceans to reach new areas of coastline. This species is nocturnal, and spends most of the day sleeping on the sea floor. Hunting is done at night, and diet consists of small crustaceans and fish. Little is known about its life history and reproductive behavior, but females are known to give birth to live pups. The litter size is usually 15 to 20 pups. All species of sawfish are considered vulnerable or endangered because of population decline. Sawfish are sometimes accidentally caught in fishing nets and they are also hunted for their rostrum, their fins (which are eaten as a delicacy), and their liver oil (used for medicine). Habitat disturbance is also a threat. 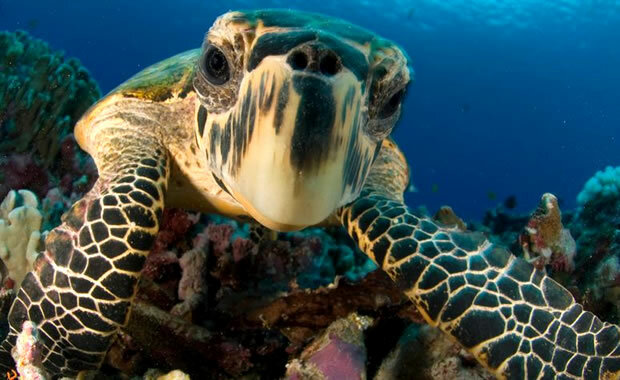 This species is legally protected in the United States and Australia, and the state of Florida has established three wildlife refuges to protect the habitat of the species. Copyright Notice: This article is licensed under the GNU Free Documentation License. It uses material from the Wikipedia article "Smalltooth sawfish". Glenn, C. R. 2006. 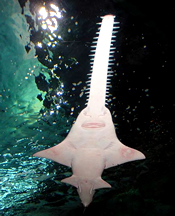 "Earth's Endangered Creatures - Smalltooth Sawfish Facts" (Online). Accessed 4/24/2019 at http://earthsendangered.com/profile.asp?sp=820&ID=9. Need more Smalltooth Sawfish facts?